It’s a long time since I’ve had a proper look around the RAF Museum in Hendon, North London. On my last visit I was in a rush to get to the research library upstairs. 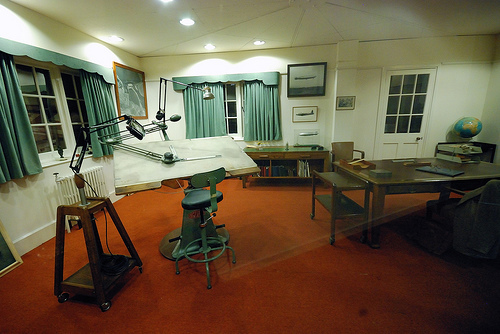 So I’ve missed the fact that there is a re-creation of Barnes Wallis’s office in the exhibition hall, complete with his real drawing board and other paraphernalia. From this picture it looks as though the famous photograph of the Möhne lake after the dam was broken is hanging in the corner. Wallis brought this to the party in the Hungaria restaurant after the Buckingham Palace investiture ceremony, where it was signed by most of the surviving aircrew who took part in the raid. Full set of mickb’s pictures are here on Flickr.